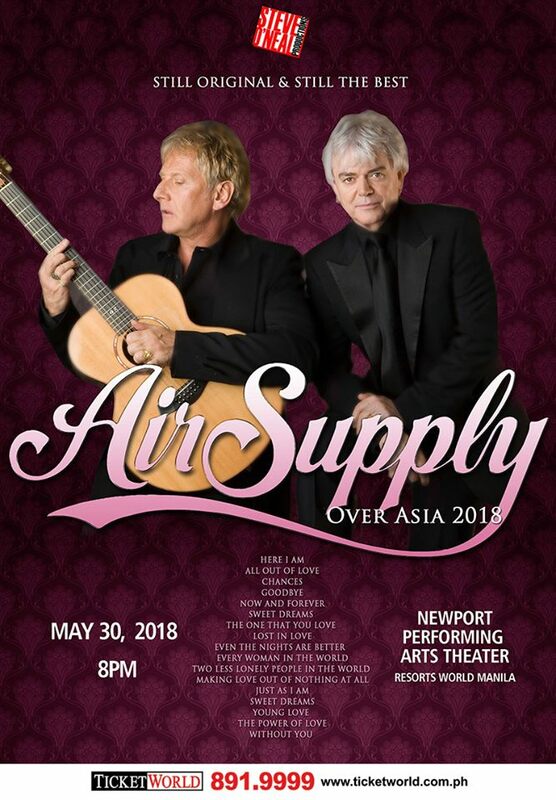 Reminisce the past with Australian soft-rock duo Air Supply as they return once more to the Philippines for their Over Asia 2018 tour on May 30, 2018, at the Newport Performing Arts Theatre in Resort World Manila, Pasay City. Returning multiple times in the Philippines, they’ve continued to serenade their Filipino fans over the years. Composed of Graham Rusell and Russel Hitchcock, the now duo continues to sing their popular hits and make the crown sing with them again. Tickets will be available soon at TicketWorld Manila outlets and online. The band is known for their famous hits such as Two Less Lonely People in the World, Lost in Love, Every Woman in the World, and Now and Forever. Relive the classic hits once more as they conquer the love songs of the 80’s in one special night.